Loafers, the shoes, are low, traditionally flat (though some have heels), often leather shoes with no laces to worry about. They're slip-on and slip-off types of footwear. Loafers, the people, are idle constantly. They're lazy and unproductive. Surprisingly--or maybe not--this is not where the shoes got their name. Loafers were created and named in the 1930s after Esquire printed pictures of farmers wearing similar footwear on dairy farms in the "loafing areas" where cows waited to be milked. Always ready to jump on the next new idea, America jumped on the style. The Spauldings family in New Hampshire created--and named--the first loafers. 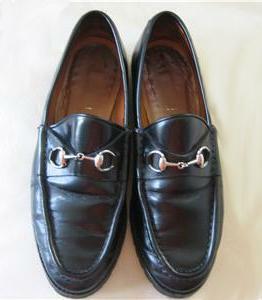 Since then, loafers have had quite a few names and nicknames--ponies, Weejuns and eventually penny loafers. That name came about because people used actual pennies as ornaments between the lips on the top of the shoe. It was the perfect size to house pennies--and later dimes--for decoration or unexpected phone calls at a pay phone. Socks are optional, and styles of loafers vary. Men mostly wear loafers, though there are some women's styles out there as well (those are usually the ones with heels). They're similar to the boat shoes men enjoy wearing on a comfortable, casual day. If you're wearing the traditional kind of flat, leather loafers, you'll be fine in shorts. If you're wearing them with shorts, skip the socks. You can also wear them with your favorite pair of lazy day blue jeans or rugged khakis. Heck, you can even wear them with your nicer khakis if you'd like. In this case, do wear socks to dress the shoes up a bit. They're a go-with-anything type of shoe, for men, at least. Just skip them when you're off to work in a dressy environment. Women, as usual, have a bit more versatility in the world of loafers. They come in any color imaginable and in more materials than your average leather. Heel heights vary, as do the outfits they complement. Wear a black leather pair with a medium heel with a skirt, sweater and thigh highs for a great fall look reminiscent of your schoolgirl days. Slide into a more casual pair with blue jeans and a t-shirt for hanging out at home. Depending on the style of your loafers, the possibilities really are endless. Loafers have come a very long way since the 1930s! Just what every woman who loves classic styles with funky twists needs, the Report Ginger in Red available at Zappos.com screams fashion! The best news is, they're just in time for fall--and wedges will be huge this year. The Dr. Martens Dana Loafer is a heeled version of an old classic. It's available in brown and black. Bruno Magli makes a beautiful pair of designer loafers for men. They are classic in style and made of rich leather. For a less expensive option, try the Dexter Hudson. These got great ratings overall, as well on comfort and look.